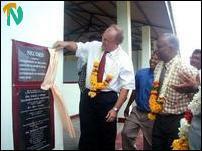 Dr Roland F.Steurer, Director of German Development Co-operation (GTZ) based in Colombo Tuesday declared open a school building constructed at a cost of about 10 million rupees by the North East Community Restoration Development (NECORD) project in Sithoor Muslim Vidiyalayam in Iqbal Nagar, sources said. Iqbal Nagar is located about eight km off north of Trincomalee town along Uppuveli-Kuchchaveli road. Dr Roland Steurer, NECORD Project Director Mr.T.Lankaneson, Trincomalee Zonal Director of Education Mr.K.Thilakaretnam, NECORD Deputy Project Director Mr.N.Puhendran, School Works Engineer Mr.S.Perasiriyan and other officials were taken in a procession to the school new building with Trincomalee Orr's Hill Vivekananda College band in attendance, sources said. Dr Steurer, along with the NECORD Project Director Mr.Lankaneson, unveiled the plaque of the new building . Residents of Sithoor village, all of them Muslims, were displaced twice in the ethnic violence. "About 225 families lived in the village before 1995. The displaced families lived in refugee camps and welfare centres before returning to Sithoor. The same families fled again in 1999 violence," said Principal Mr.T. Akbar in his speech at the meeting held in the school after the opening of the new building. Muslim girls students sing welcome song while Dr.Roland Steurer and Mr.Lankaneson standing behind. He outlined the urgent needs of his school. For the first time in the forty-year old history of the school a batch of students are to sit for the G.C.E. Ordinary Level examination. However, shortage of teachers prevails in the school to teach English language and Science, Principal said. The principal thanked NECORD for its timely contribution to the development of the school when the resettled internally displaced families are trying very hard to restore normalcy in their lives. 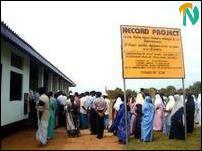 Mr.Lankaneson said NECORD has been providing new buildings to schools in war-affected areas. 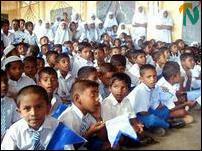 About 2000 schools are in northeast province. But NECORD could help only about 200 schools under the reconstruction programme, he said. He urged the parents, especially mothers, to take keen interest in the education of their children, saying that education is the only asset to ensure bright future to the young generation. Dr.Roland F.Steurer said in his speech that GTZ is very proud to extend its support and assistance to NECORD to reconstruct school buildings where students study in an environment without classroom and learning facilities. GTZ is also supporting the rehabilitation, reconstruction and resettlement programme in the war-torn province from Jaffna to Batticaloa. A section of students participating in the opening event. New school building surrounded by parents. Dr.Roland F.Steurer unveils the plaque of the new building with NECORD Project Director Mr.Lankaneson (with garlands) looks on . School Principal Mr.Akbar is seen in the middle. Band of a Tamil school, Trincomalee Vivekandanda College was in attendance of the opening of a new school building in Chithoor Muslim Vidiyalayam.